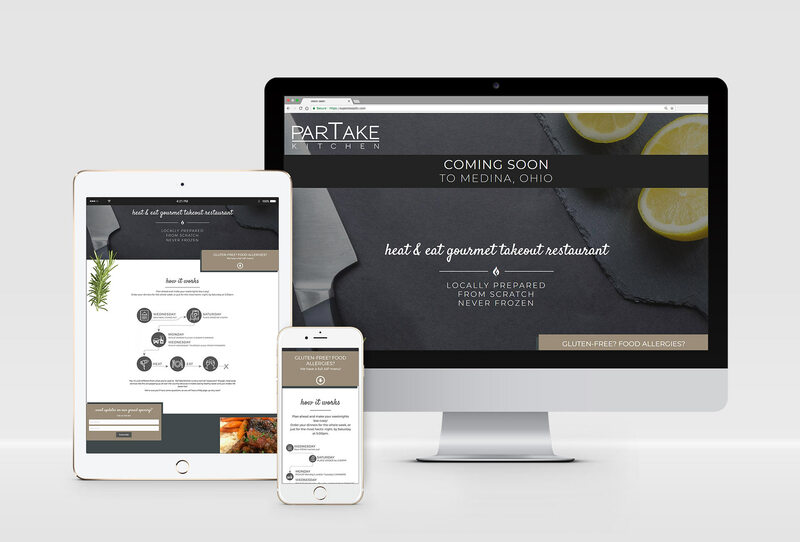 ParTake Kitchen is a unique takeout restaurant that is going to be opening in Medina, Ohio in mid-2019. Services like this have started to pop up all over the U.S. because it’s a genius way to make weeknights less crazy while still serving your family a real dinner. Often referred to as a “meal prep service”, dinners for the week are ordered over the weekend and picked up on Mondays and/or Wednesdays. They’re expertly chilled (never frozen) so they just need to be warmed up. What’s extra unique about this restaurant is that they offer a AIP menu with is gluten-free and safe for people with allergies to nuts, dairy, sugar, and wheat, and is highly recommended for people battling any kind of inflammation. Their Coming Soon page is helping to build their audience, provide an introduction to the company and explains how the service works while the kitchen’s licensing and inspections are being finished. Meanwhile, the backend development, design and setup of the full website is in full swing! Because this service is very different from what people are used to, I needed to make sure the process was explained thoroughly but could be understood quickly. What better way to achieve that than with an infographic! Once the kitchen is open, their full website will feature the weekly menu and online ordering. The unique service and ordering process presented challenges on the e-commerce side of the site as well (luckily I like a good challenge). In addition to defining which meals could be picked up on which days, we also want customers to receive pickup reminders via text (Twilio SMS) and an email on the day they have an order to pickup.